Your Samsung Galaxy S6 Camera application can also function as a digital camcorder. 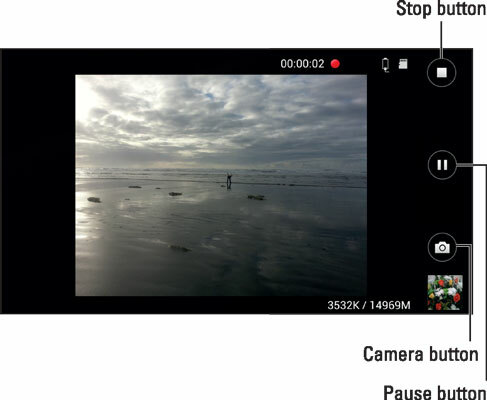 All you need to do to use your phone as a video recorder is to put your camera into Camcorder mode. From the camera viewfinder, shown here, you tap the icon with the silhouette of a movie camera in the upper-right corner and you switch from photographer to videographer. If you press the pause button while in camcorder mode, the buttons to the right morph into two additional buttons. You can tap the upper button to switch back to the camera. Your other option is to tap the button with the red dot to begin recording again. Just as you share photos you take with the camera, you can immediately share a video, play it, or delete it by tapping the video viewer. Also, the video is immediately saved on your camera. It’s stored in the Gallery app (described earlier in this chapter) or is viewable from your Video Player app. You can get fancy with some of the settings for your camcorder, but you won’t find nearly as many settings as you have for your camera (fortunately!). Two settings, Video Size and Image Stabilization, are available in Settings from the Menu button. You cannot get to the Settings screen from the camcorder viewfinder. You must go back to camera mode. From there you tap the Settings icon to get to these options. Use Image Stabilization unless you like the feeling of being seasick. It’s turned on by default.